wtf this is the first I heard of this. I would be so pissed if I paid for a game (front and close to front row too!) and was looking at a tv screen to watch the game! Unbelievable and I fail to even see the use for it in the first place..this has to be gotten rid of soon right? That thing is absolutely ridiculous. I'd have to call my lawyer if I payed big buck to get close and that thing rolled into my field of vision. Best of both worlds, you get the atmosphere of being at the game but watch it on TV. I don't get what people are complaing about. I’ve never seen it from that angle, and didn’t realize that it has a big TV on it. I have seen/noticed the contraption before( on TV broadcast) and my first thought was “I’d be pissed, if that thing rolled up in front of me”. I’ve had people try to hold up signs/flags in front of me, or wear a big foam hat, I ask once for them to put it below my view line, if they don’t comply, I get a staff member to have them do it, as far as I know all Stadiums have rules that don’t allow you to obstruct another persons view. Boogers POS should fall into that same category IMHO. pmedic920 wrote: I’ve never seen it from that angle, and didn’t realize that it has a big TV on it. So, many years ago I got 9th row tickets to see Jerry Rice final game at the 'stick. It was the game where Terrell Ownes went of for like 20 receptions and 200+yards. Anyway, the Fox camera kept parking itself right in front of me when the team was close by. It is for that reason that when I got my season tix, I got tickets in the second deck of Levis. getnasty wrote: Best of both worlds, you get the atmosphere of being at the game but watch it on TV. I don't get what people are complaing about. I'm a little confused. Why is this Booger's throne? Is he sitting on it? Does he travel down the field on that thing? Is the screen in front of him or behind him? Is the intention to let people see the game because he would otherwise be blocking their view (because that would be stupid)? HawkGA wrote: I'm a little confused. Why is this Booger's throne? Is he sitting on it? Does he travel down the field on that thing? Is the screen in front of him or behind him? Is the intention to let people see the game because he would otherwise be blocking their view (because that would be stupid)? The thread I linked to explains it in more detail but some people are calling it his "throne" because he's sitting on this big raised platform on the sidelines that apparently moves around up and down the sidelines during the game depending on where the action is + I think he moves around in order to constantly be in front of the line of scrimmage. 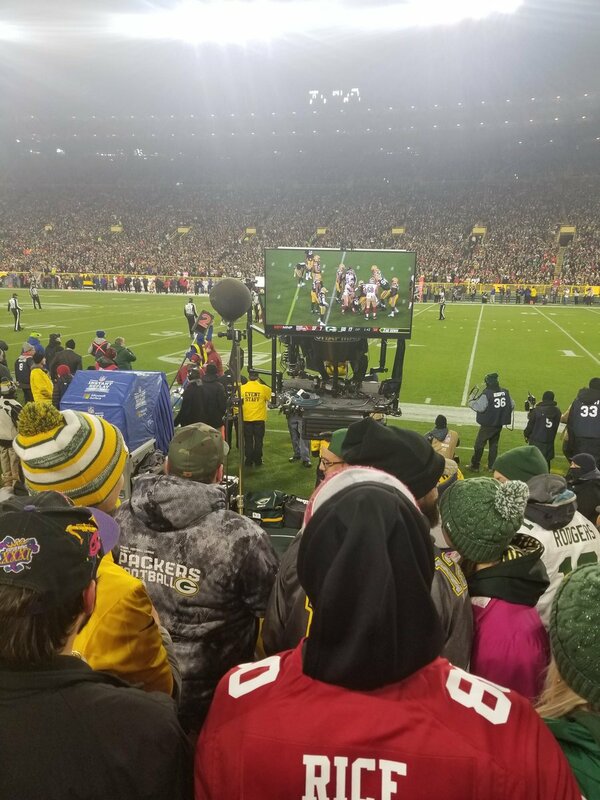 The screen is behind him, attached to his "throne" and yes the point is so people can watch the action (on a delay no less) while he is blocking them from seeing a good portion of the game. Seeing as his name is Booger, maybe Snot Rocket is a more apt name than "Throne". Just put the poor guy in the damn booth already, I'm not sure what the point of it ever was aside from not having him throttle Jason Witten. Wow, that's messed up. Who at ESPN thought that was a good idea? ESPN owned by Disney, now ask yourself they managed to screw up a winning formula in Star Wars, is there any question about how they have screwed up Monday Night Football since moving it to ESPN from ABC. It's stupid because having Booger doing that doesn't make the game more watchable. I've watched only 1 MNF game - the Seahawks game. The MNF telecast crew is horrendous. Well ABC is owned by Disney too, so not sure the logic follows. But totally with you on them screwing up Star Wars. Well thank god that thing is not coming back. And the bonus of the changes to MNF is one less Cowboy to listen to on an NFL broadcast. LOL...the "Boogermobile"....sounds like something out of Revenge of the Nerds. Hair Pie? Oh Sank You!